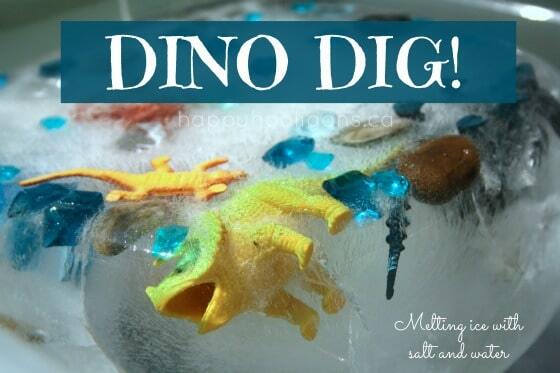 Dino Dig: Melting ice with salt and water. 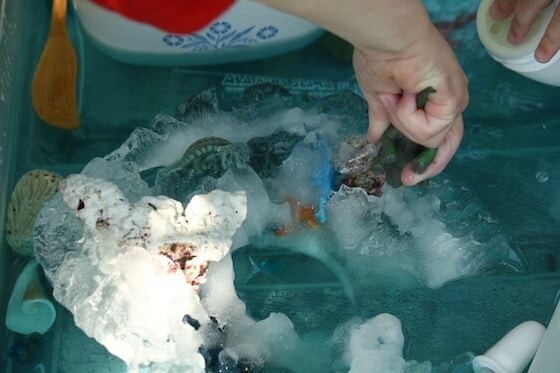 Science, water play, and fine motor development all wrapped up in a fun, icy activity! 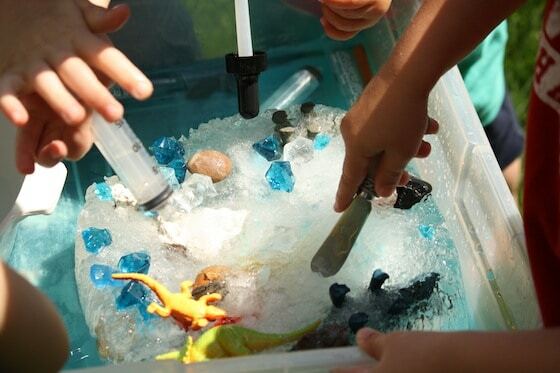 When it comes to simple science activities, ice and salt and water are always a huge hit! 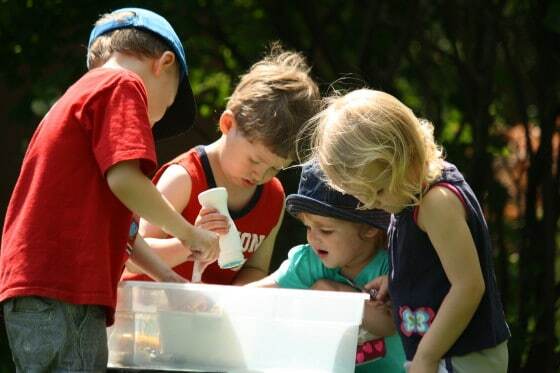 Simple water play activities always captivates my daycare hooligans for hours, and this one is a always a favourite. I’ve been itching for the weather to warm up so we could do it again, but I wasn’t sure if this year’s crowd would get into it as seriously as last year’s did. Well, I’m happy to say that they loved it just as much as the gang did last Spring, and this year, I made our ice block quite a bit bigger, and they were at it for 2 solid hours. Yep, you read that right. TWO solid hours. If you’re looking for an activity to keep your hooligans engaged for a good looong time this summer, THIS is the one for you! It’s really easy to prepare, and won’t cost you a thing! We froze our ice in layers, over the course of a couple of days, adding a few items to the water, placing the container in the freezer, and repeating with another layer when the previous one was frozen. When our ice block was frozen, I decided to make it bigger, so I placed it in a larger container, and we added cold water and a few more items and popped it back into the freezer. On Friday, I ran a little hot water over the container and our large ice block slipped right out. I placed everything in a shallow storage container, and set it on a small bench in the backyard. The first thing the hooligans went for was the coloured salt. They sprinkled it liberally all over the ice block which started the melting process. Then they used the syringes, baster and test tubes to pour the hot water over the ice. The salt mixed with the water, and turned everything an icy blue, which was really neat. Simple science, what’s not to love?! As the salt ate away at the ice, and the warm water did its work, deep wells started to form in the block, and the ice took on a bumpy, crystalized texture. The hooligans worked with their “knives” to cut and chop and dig at the ice. They tried digging the treasures out with their fingers, but soon learned that the most efficient way to get to the goods was with the water. The syringes and turkey baster required lots of co-ordination and fine motor control, and they concentrated and gave it their full effort. The little girls wandered away from the activity from time to time, but I am not kidding when I tell you that the boys did not leave the bin once in the two hours that it took them to complete their mission. They worked away, pouring and digging, and hollering excitedly when they freed something from the ice. 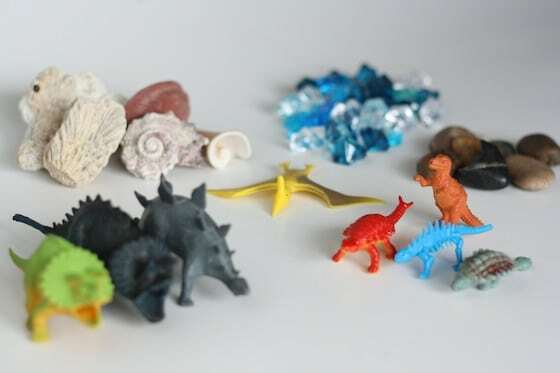 The shells and stones and crystals produced small celebrations, but the loudest cheers would go up when they got a dinosaur. I refilled their bowl with warm water once, and after that, they were happy using the water and melted ice in the bin. After about an hour and a half, I moved the activity into the shade and at that point, I flipped the ice block over to see if they wanted to go at it from the under-side. 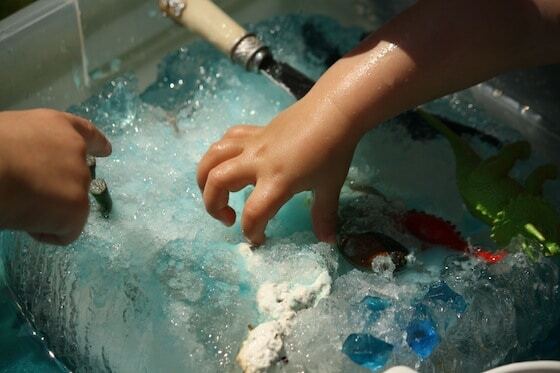 The littles loved the smooth feel of the bottom of the ice block after working with the bumpy salt-eaten side, but the boys flipped it back over, preferring to continue with their mission as they had been. 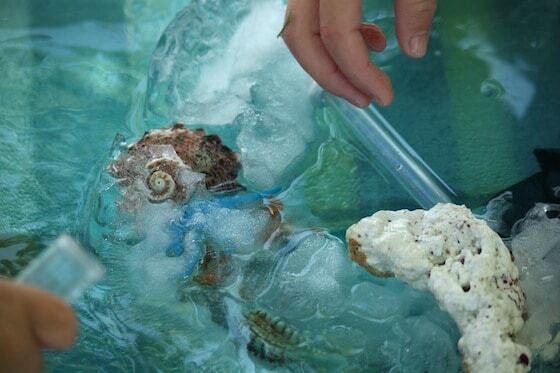 Slowly, the ice block got smaller and smaller, and they were able to break off chunks of ice, and hold them to remove whatever was encased in them. And finally, at almost the 2 hour hour mark, they freed the last of their treasures. I’m so thrilled that this activity went over this well two years in a row. I’m already thinking of doing it again this season. I just have to think of what to freeze in the ice to put a bit of a different spin on it. 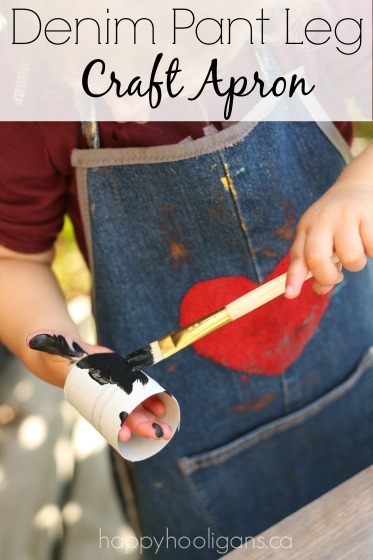 Isn’t it wonderful that a simple activity like this can engage a child for so long? Their determination and perseverance truly impressed me. And, it was a ton of fun and learning, and a great way to keep cool on a hot morning! 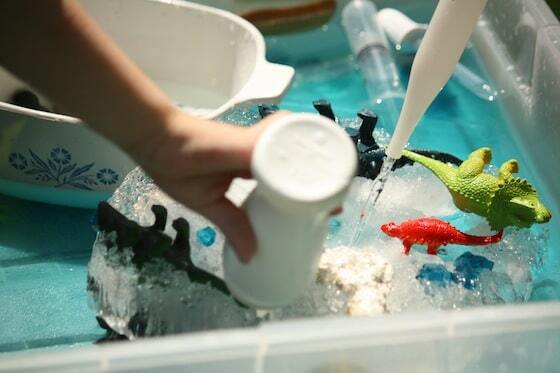 If you’re compiling a list of activities for a dinosaur themed party, this would be a super one to keep in mind! 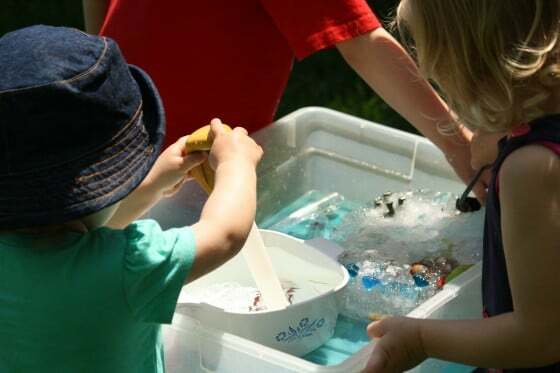 See more of our cool outdoor water play ideas for kids? Oh, Jackie, I love, love, love this! We will be doing this in our upcoming preschool dinos unit. Pinned and will share, too. Thank you! This is one of my boys’ favourite activities. It keeps them busy and happily digging for hours! Thanks for sharing. Jackie, I LOVE this! 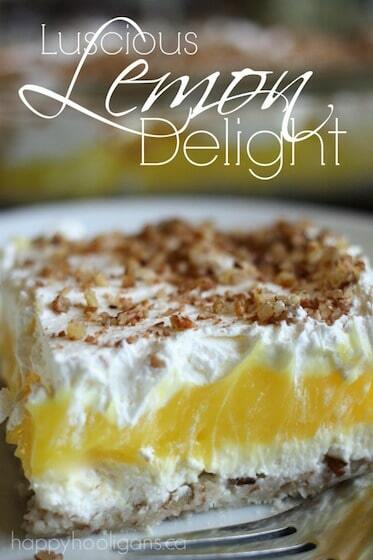 Sharing and pinning right now. Two hours?! That’s amazing! We’ve done something similar, but only a much smaller scale and with fewer tools. I’ll be taking a page from your book and going bigger with this activity next time. Love it! What I love about this is I can extend the project to my 10 and 7.5 year old who would LOVE to create this and then help their 5 year old sister melt it down. Wondering what kind of fun older kid treasures I could provide to them. Finding the right items, I think it could even work for an older kid birthday party activity. Fun! I know exactly what you’re saying, Kim. My own boys used to really get into the daycare activities when they’d get home from school at that age too. My 12 year old is still interested in some of the things we do here. Weve done this at playgroup but used natural materials found on a walk. Fir cones, leaves, flowers and shells. You could use money for older ones �1 coins, silvers. Especially 1 layer at a time you could have a �2 coin in the middle! I absolutely love your ideas!! Perfect! 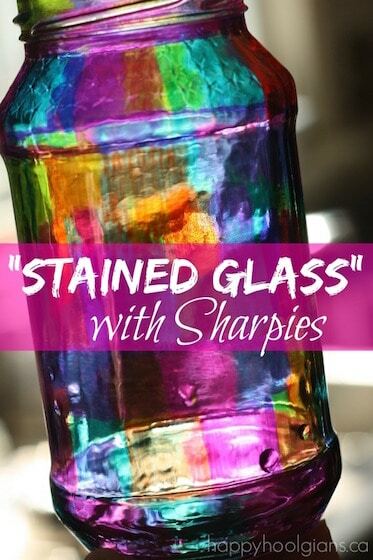 If they love treasures, they’ll LOVE this activity! 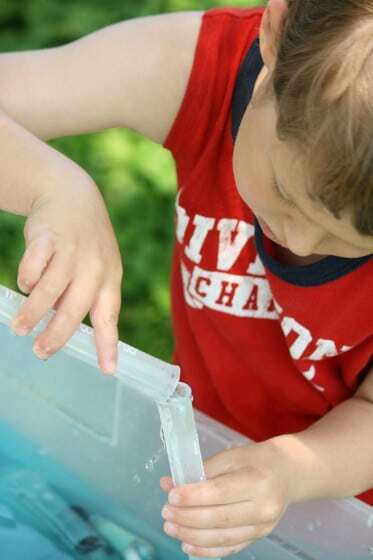 We also used food coloring to add a different color to each layer of water/ice. Loved this project! It’s hard to tell how big the block of ice is in the pictures. I’m going to do this with my class, but I wanted to see how large the block of ice was and how many kids you had working on it at one time. I started off with a Tupperware brand container designed to hold a carton of ice cream. Once it was frozen, I popped that block of ice into quite a large container that I used to store muffins and cookies in. It probably measures 12″x12″ and is probably about 5″ high. That was a good size for 4 or 5 kids to work comfortably around. You could just make several of them up if you had a larger group. 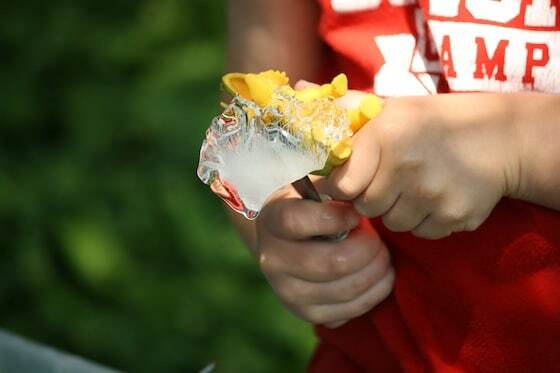 Make one, freeze it, pop it out, keep it in the freezer, and use the container to make the next one, and so on. 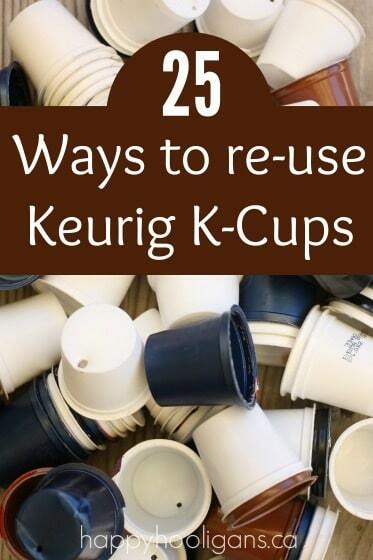 You’d probably want to give each one a good 24 hours at least to freeze. I absolutely just love this! 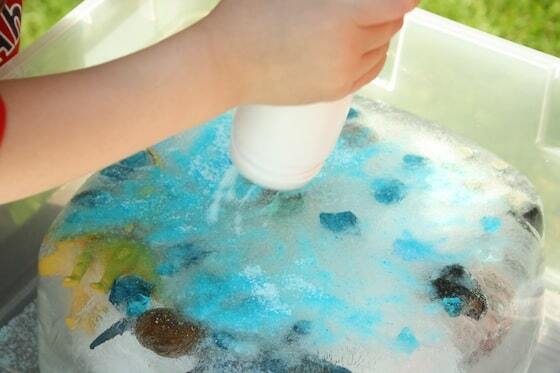 What a fun way to combine sensory play and learning! Thank you so much for linking up to Discover & Explore! OMG! We did this one too, just a couple of weeks ago! What a coincidence! Inspiring. Ice is new way forward! 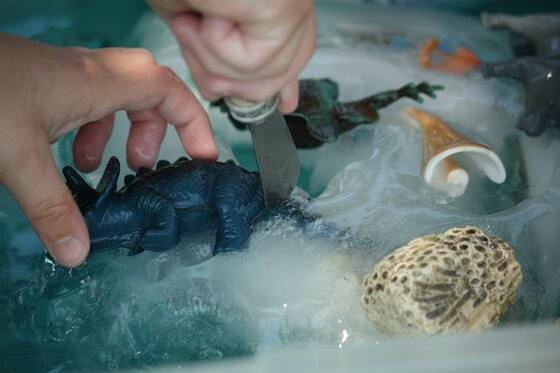 I’m doing this activity at my son’s dragon themed birthday party and am putting “dragon eggs” in the ice. I hope the guests enjoy it as much as your kiddos! I was just thinking that using some plastic easter eggs with baby dinos/treasure inside would add an element of surprise when they finally “dug” one out! I love that idea, Jennifer! 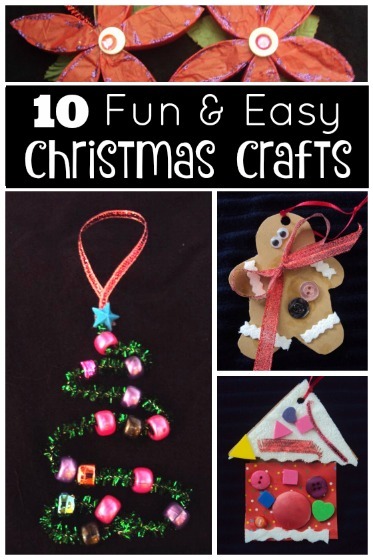 Will be making this weekend for the kids I watch to play with next week! Looks awesome! Using small real fossils is fun, especially for the older ones. Fake T. rex teeth, sharks’ teeth, bags of petrified wood are available on eBay for reasonable prices. We re-use these items each year and add a few new ones. 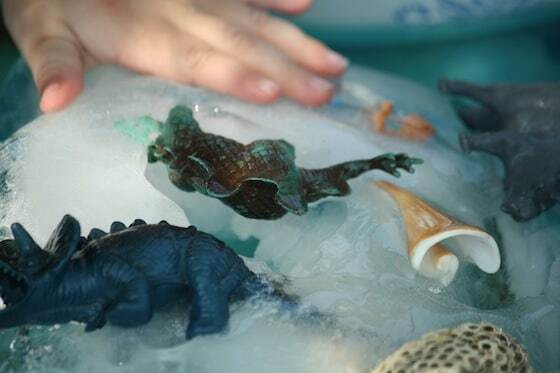 We have used sand and plastic peanuts to hide the fossils but I like your idea of ice and the extra dimensions that adds. Great fun! 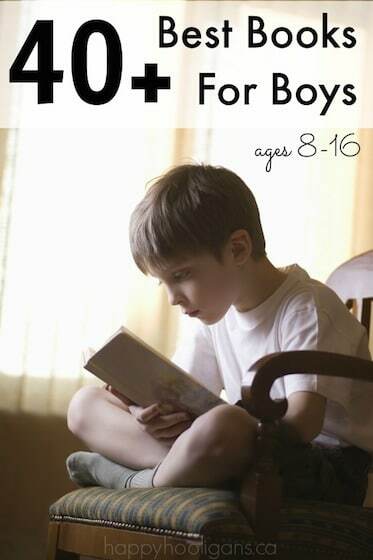 You could get the girls interested longer if you put some other items in there that would interest them more. Maybe JEWELS,tea cups, dishes, all things that you could actually dig up. Yes, the 2 year olds here love this. The older children stay at it longer because they’re working with a purpose, but the 2’s love the experimental play involved. So much fun! Have you considered a “Frozen” themed ice block? Maybe some princesses could be trapped in the ice? Might help excite some of the girls who walked away?